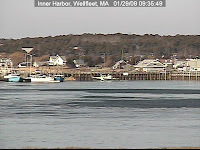 I found a new webcam (new to me, anyway) that overlooks Wellfleet harbor. This camera apparently pans and takes a panaramic view of the whole harbor area. Well worth a look-see. Take a look at http://www.mywellfleet.com/. PS. If you look at night, it'll be dark. Although its not for sale, the White House would make a pretty expensive home. Given its size and location (and 35 bathrooms), the White House is valued at $308 million. And, it's not even on the water! Read the whole story on BusinessWeek's Hot Property website. What would the Title V septic system look like if it was in Eastham? Hmmm. Existing Home Sales - Up Significantly!! In perhaps the best housing report of the great housing slump, existing home sales jumped 6.5 percent in December to a 4.740 million unit annual rate -- a gain that indicates lower mortgage rates are now boosting home sales. The jump cut nicely into supply on the market, now at 3.676 million homes and down nearly 12 percent from November and making for 9.3 months of supply at the current sales rate, down steeply from November's 11.2 months. Read the whole story on Bloomberg ... Here. Good news! Of note, the inventory in Eastham has dipped to under a year's worth of sales. It's no secret that 2009 is going to be a tough year for real estate, even out here on Outer Cape Cod. But, we've seen signs of improvement (e.g. lower inventory, great mortgage rates). That said, HGTV's Frontdoor.com recently published an article providing tips for buying and selling in 2009. It's not rocket science, but it serves as a good reminder of the extra steps (and opportunities?) that these difficult times provide. January 25 - "A Night to Remember"
February 1 - "Treasure Island"
February 8 - "Cast Away"
February 15 - "Master and Commander"
February 22 - "The Perfect Storm"
All the movies have a maritime theme (duh!) and are free. Jan 23, 2009 is the 100th anniversary commemoration of the first wireless distress call at sea. The event will be celebrated globally by amateur radio operators, maritime historians, many are former military sparkies, and commercial maritime radio operators. On a cold January night in 1909, in a deep fog, two ships collided off Nantucket. The Republic, was a luxury liner, of the White Star Line (remember the Titanic?) headed out from New York City for a leisurely cruise around the Mediterranean. The Florida, was filled with impoverished people fleeing the consequences of an earthquake in Messina, Italy, in the hope of a better life in America. In a move necessitated by a contract with Major League Baseball, the Orleans Cardinals have changed their name to the Orleans Firebirds. Read the whole convoluted story and learn a bit of history on the College Baseball blog. Fun reading! The Firebirds' first home game will be June 13th. Comparisons are always interesting. Here are a few that may provide an interesting perspective on the current financial mess. These figures were shared in a recent speech by the Lt Governor of Utah, Gary Herbert. This doesn't mean we have nothing to worry about, but the current hole isn't as deep as we've seen. 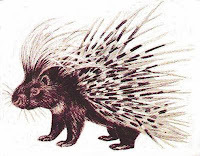 This past week a very rare sighting was made of a porcupine in Eastham, near the bike path, on Locust Road. I say 'sighting' but the animal was actually roadkill. Since porcupines are nocturnal, they 'travel' at night and probably was nailed while crossing the road. Since porcupines aren't known to be on the Cape, how did it get all the way to the Outer Cape? The answer will never be known, but one theory is that it may have been 'bundled' into a load of Christmas trees and delivered here. An involuntary stow-away! This story appeared in Friday's Cape Codder - take a look. Below are 2 graphs that didn't fit the year-end report from my February newsletter. If you'd like to subscribe to the newsletter - click Here. 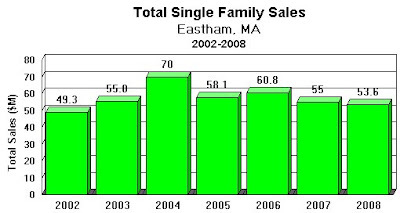 The first graph shows the total value (in $M) of the single family homes sold in Eastham. It shows, fairly dramatically, when the slowdown began. The good news for Eastham is that, although volume decreased about 30%, the home prices did not. The next graph shows current active single family homes in the context of the last 2 years. You'll see that inventory is decreasing. Time will tell us whether this is real or just a slow month in a normally slow season. It could be the beginning of a more balanced marketplace, caused in part, by renewed buying encouraged by the record low mortgage interest rates. Should You Refinance? Maybe Not! With the rates down at 5% for a 30 year fixed mortgage (or even 4.65% for a 15 year fixed), should you jump to refinance? Maybe not! There are quite a few factors that need to be considered before you decide whether to take the refinance step. As an example - will the closing costs of your new mortgage be more than the savings you'll enjoy with reduced payments? If your home's value has declined, do you need to put up more cash to avoid PMI? If you are thinking of making the call to your mortgage person, you need to read this article from the Fox Business Channel's website. Buyer Traffic Seems To Be Picking Up! Buyer traffic seems to be picking up. I managed to close on a deal for a nice 2 bedroom ranch near the Eastham windmill. The real closing will be sometime in March, in plenty of time for the new Buyers, my clients, to get it ready for the summer season. Now for the 'hard work', with home inspections, water tests, septic plan reviews, legal document approvals, etc. Today's dusting of snow reminds me that it's still winter, but spring is just around the corner. Yeah! Say It Ain't So - Please! Unfortunately, we all know the truth. One of the prerequisites of a house changing hands in Eastham (at a closing), is that existing fuel oil tanks must either be double-walled or must be demonstrably less than 10 years old. Eastham (and other Outer Cape towns) has instituted this new 'rule' to prevent to release of fuel oil into the fragile aqua-system of the Outer Cape. If a home seller has a 'new' single-walled tank, he needs to get a variance from the fire department. The fire department requires the tank to be stamped with the date of manufacture or that the home seller provide the invoice showing when the tank was installed prior to issuing the variance. Lacking a variance, the home seller must replace the existing oil tank with a new double walled tank and have the old tank removed. This is roughly a $2,000 expense. Of course, homes without an oil tank don't face this issue. 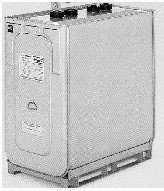 An alternative to installing a new oil tank is conversion to natural gas heating. Many streets in Eastham have buried gas lines, making this conversion a viable option. Although conversion can be costly, the expense can be reduced by taking advantage of promotions offered by the gas company as their way of locking you in as a new customer. Also, sometimes the Seller will grant the Buyer a credit, at closing, since they will not have to pay for the take conversion. Lastly, buried oil tanks are forbidden and must be removed prior to closing. If you think the PanMass Challenge is a long bike ride, Truro native Ellery Althaus’s upcoming pan-Eurasian bike trip will strike you as a challenge indeed: 1,000 miles a month for 10 months. And, Althaus is looking for sponsors to help make the trip possible. 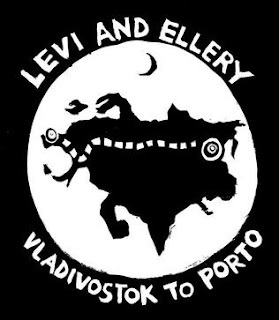 Ellery Althaus and his friend, Levi Bridges, who is from Maine, will be flying from Boston to Moscow in late February. The two will travel the Trans-Siberian railroad across Russia to Vladivostok, on the Pacific side. There they will train and take a half-semester of intensive Russian at a local university, then head out on their bikes when the snow clears, westward into the wind across Russia. They will enter Europe through the Ukraine, then head down to Porto, Portugal. The 10,000-mile trip will take 10 months. Check out the Cape Codder story for more information. The trip will be chronicled on the bikers' website. The index card on the right is from the blog "Indexed". 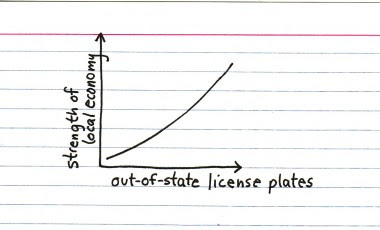 For the Outer Cape the left endpoint is the off-season and the right endpoint is August 1st. There is legislation afoot that will impose a 9.7% 'room' tax on seasonal rentals on the Cape (and all of Massachusetts). The state legislation to allow the towns to impose this tax is a near certainty. The towns may then impose the tax at their respective Town Meetings (Eastham's is May 4th). The 9.7% tax will be split, with the state getting 5.7% and the towns getting the remaining 4%. 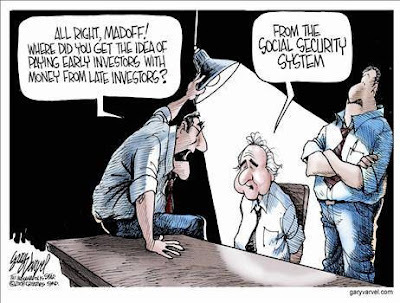 The purpose is to simply collect more money to cover budget shortfalls. The discussion about this bill centers on 3 areas. Firstly, will this tax 'hurt' the summer rental business? Since most rental landlords want to keep their weekly rentals fees level (or slightly more) with 2008, the tax will be on top of the rental fees. The Outer Cape will then be 10% less competitive that other locations. This will hurt. Secondly - Who will collect this tax? The current discussion is that the local rental agencies won't be collecting the fees, since they only represent a fraction of the total rental homes. Then who? and How? Lastly - the vote. The vast majority of the landlords who own rental property on the Outer Cape don't live here. Therefore they will not get to vote at the town meetings. The taxes will be imposed by the folks who live in the towns, but they will not have to pay. This is certainly unfair to the rental homeowners.